Background: Although most of the literature refers to sinusitis and upper respiratory tract as causative factor of otitis media (OM), only few articles refer to actual nasal pathologies that can lead to it. 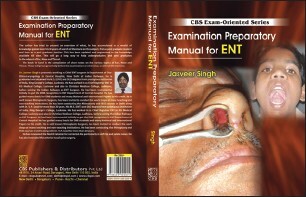 Objective: To study the influence of sinonasal disease on the middle ear condition (OM). 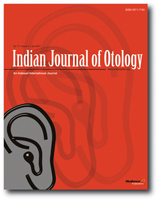 Material and Methods: 200 patients of otitis media attending ENT Services of teaching institution in Central India were included.In 340 ears detailed ENT examination was carried out. Results: Of the 200 patients of otitis media 50% had chronic suppurative otitis media tubotympanic type, 41% had retraction and remaining had cholesteatoma and otitis media with effusion. Sinonasal evaluation revealed deviated nasal septum in 80%, sinusitis in 13.5% and polyp in 10.5% patients. Multiple sinonasal pathologies were present in some patients. On treatment of sinonasal disease signiﬁcant improvement of middle ear disease was found in 79.31% ears after septal correction (Wilcoxon Signed rank test, P<0.05), 82.35% ears after treatment of sinusitis and in 76.92% ears after polypectomy. Conclusion: On the basis of these results we recommend evaluation and treatment of sinonasal disease before surgical treatment of ear disease is undertaken. Background: The mandible is the largest, strongest and the lowest bone in the face. At birth, the two halves of the mandible are united by a fibrous symphysis menti in the median plane and are replaced by bone after 1 year of postnatal life. Observations and Results: The posterior symphysial surface bears a small elevation often divided into upper and lower parts, the mental spines (genial tubercles). Discussion: Superior to the mental spines, most of the mandible displays a lingual foramen that opens into a canal traversing the bone containing a branch of the lingual artery. The main aim of this present study is to determine the location and variations of the lingual foramen so as to contribute additional information to our existing knowledge during surgical interventions of symphysis menti, especially during genioplasties and implants. 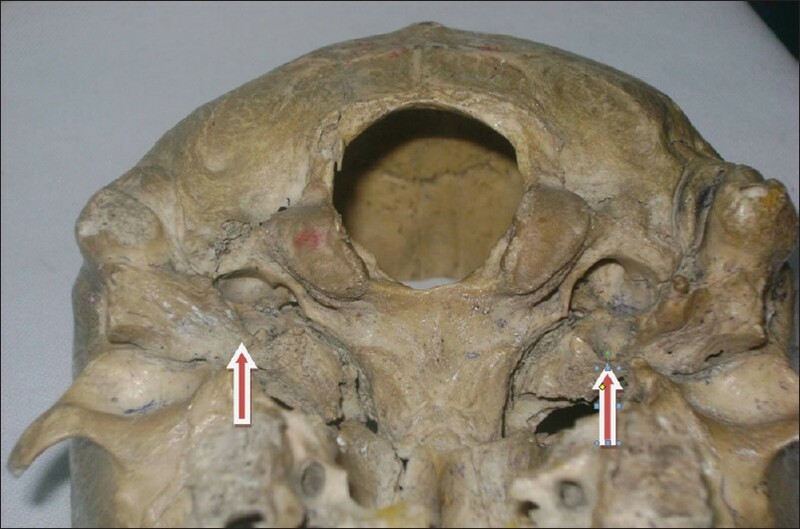 Aims: To assess the size and bridging patterns of jugular foramina of adult human skulls. Materials and Methods: The study was conducted on 56 adult North - Indian skulls procured from Department of Anatomy of Santosh Medical College, Ghaziabad. The jugular foramina were observed by naked eye and with magnifying lens to assess the variations in size and bridging patterns. 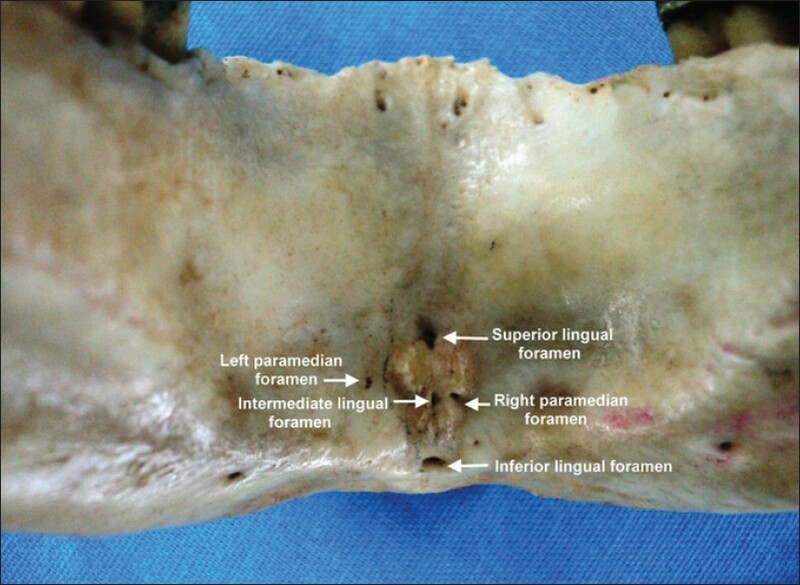 Results: The jugular foramen was larger on the right side in 53.5% skulls and on the left side in 7.1% skulls. In the remaining skulls (39.4%) it was equal on both sides. Complete tripartite division was observed in 10.7% cases. Incomplete division was seen in 7.1% cases on right side and 3.5% cases on the left side. Incomplete division was never observed bilaterally. 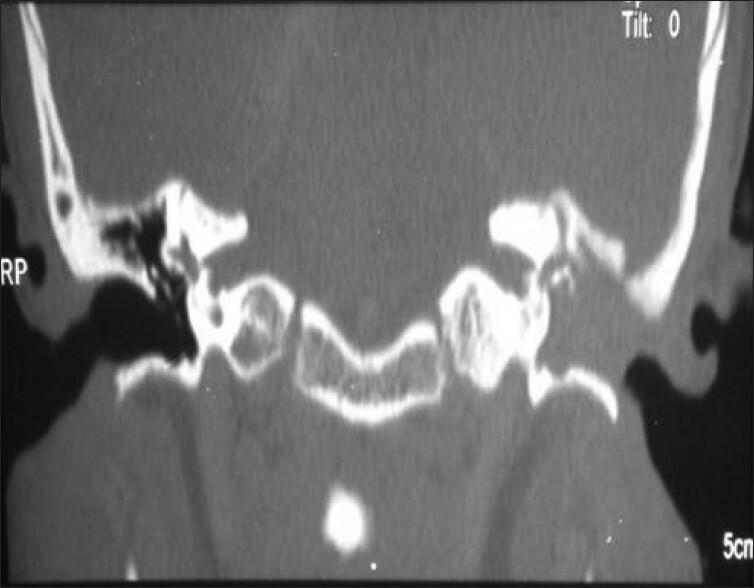 An additional accessory foramen was observed to be communicating with posterior condylar canal. Conclusion: The variations observed in present study are of immense value to ENT surgeons while performing middle ear surgeries for various jugular foramen tumors. Also, the bridging patterns cause compression to structures passing through this foramen hence accentuating the clinical presentations of Glomus jugulare. We describe a young patient with conductive hearing loss (CHL) associated with a posterior semicircular canal dehiscence (PCD) next to a large jugular bulb. Vestibular evoked myogenic potentials (VEMPs), audiogram, and computed tomography (CT) confirmed the diagnosis. The contralateral ear also showed lowered VEMP thresholds and PCD on CT, but no CHL. 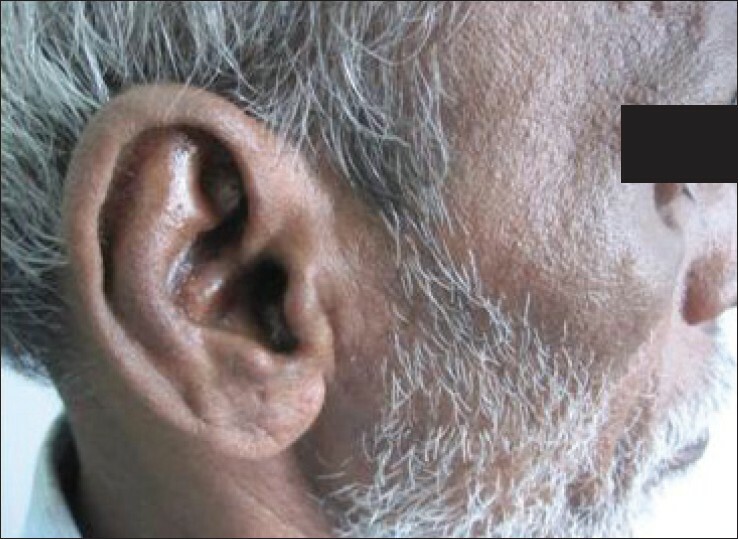 Increased vigilance is warranted in the evaluation of CHL in patients with uninfected, normal-appearing ears. PCD as a cause of CHL is just beginning to surface in the otologic literature. This case, along with two other recent case series, demonstrates the need for CT imaging in cases of atypical CHL. A nevus in the external auditory canal is very rare. So far, fewer than 20 cases of nevus in external auditory cnal have been reported in the literature. In this case the patient presented with complaints of ear discharge, otalgia, and deafness. These symptoms are present in common diseases like polyp with otitis media, unsafe otitis media or keratosis obturans or rarely a malignant lesion. The purpose of this case report is to keep in mind such rare possibility with common symptoms of presentation and relevant management of the disease can be done thus avoiding unnecessary extensive surgery. Alkaptonuria is a rare inborn error of metabolism due to the deficiency of the enzyme homogentisic acid oxidase. It presents clinically by blackish discoloration of the cartilages and collagen-containing structures of the body. There may be blackish or brown discoloration of the auricles, tympanic membrane and other areas of the head and neck. Although the initial clinical manifestation is of multiple-joint pathology, it may be diagnosed only due to characteristic black discoloration of the urine. Here we present a case of ochronosis due to alkaptonuria which had a long undiagnosed course. A 56-year-old male patient was referred to us for evaluation of nodules of the pinna. He was found to have characteristic clinical features of ochronosis. The final diagnosis was difficult and the clinical findings in the head and neck aided in supporting it. This case highlights the role of the ENT specialist in the diagnosis of this disease, the pitfalls and difficulties in diagnosis and the diagnostic dilemmas. Though the standard canal wall up and canal wall down mastoidectomies provide for reliable disease removal and good functional outcome in most cases with atticoantral chronic suppurative otitis media (CSOM), few cases remain unresponsive to such treatment. This report describes the application of tympanomastoid obliteration with blind sac closure of the EAC as a surgical technique for recurrent CSOM persisting despite multiple previous surgical treatments. 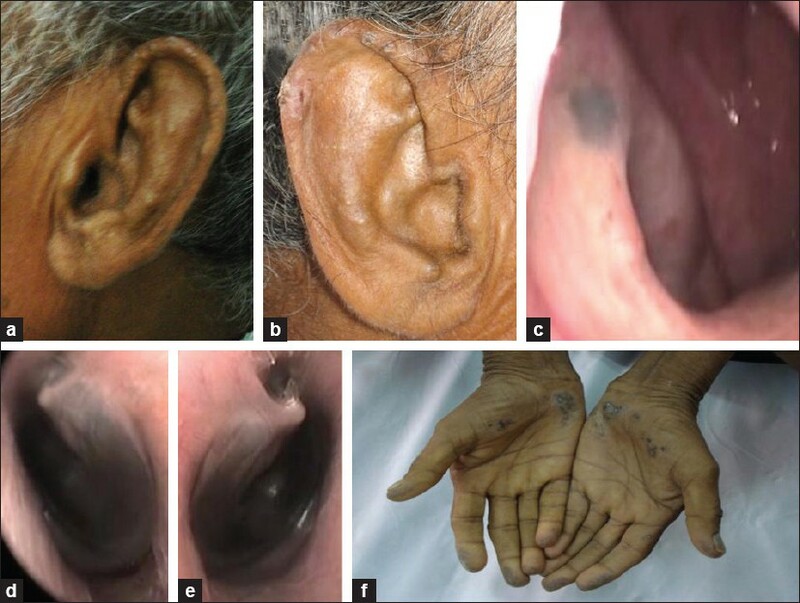 Though maximal conductive deafness is an inevitable consequence of this procedure, such morbidity may even otherwise be inevitable in this clinical situation, as scarring and destruction consequent to disease and previous surgical treatments often lead to clinical situations not amenable to tympanoplasty and hearing reconstruction. Further concerns of recurrent epithelial pearls and implantation cholesteatoma can be currently addressed by follow-up MR scanning. 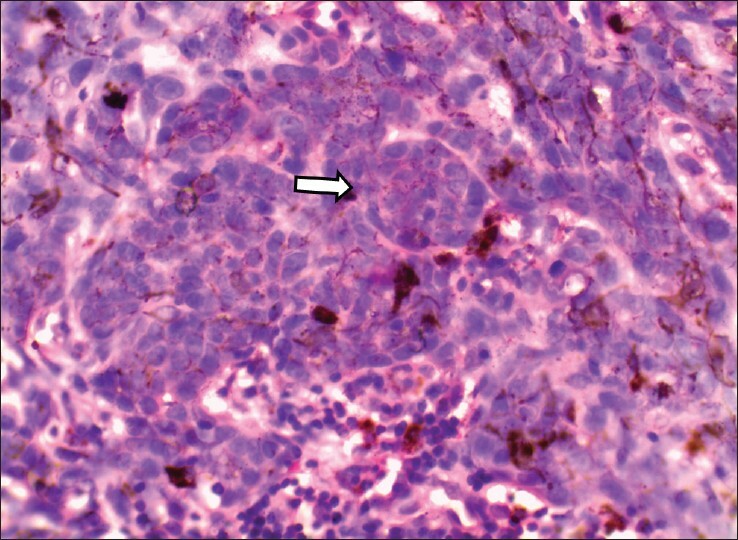 A case of otomycosis caused by Lichtheimia corymbifera from an immunocompetent patient with no known predisposing factor is reported. A 55-year-old, otherwise healthy male was presented to us with history of left-sided earache and yellowish-white ear discharge since 10 days. Ear discharge and bits of necrotic tissue were collected from ear through otoscope and processed. Direct wet mount by potassium hydroxide (10% KOH) was performed which showed broad, aseptate and branched hyphae suggestive of zygomycosis. 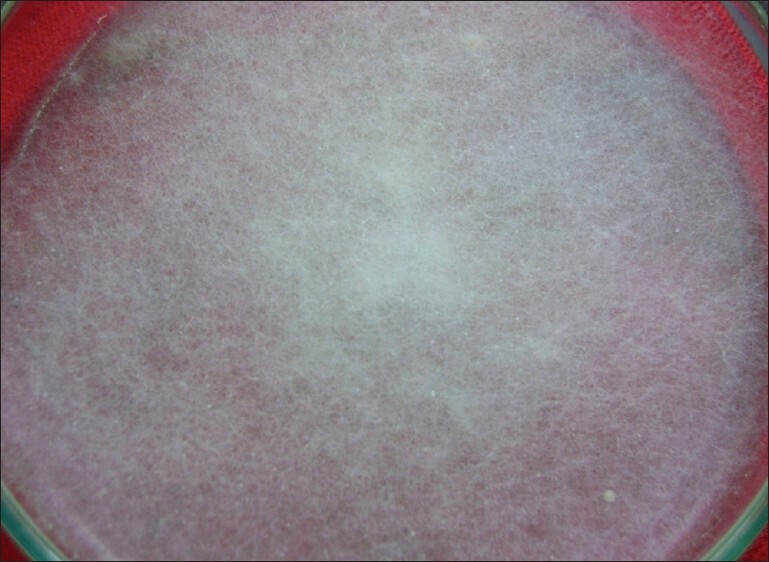 On culture after 48 hours, cottony, wooly and fluffy growth was observed. Culture was subjected to Lactophenol Cotton Blue (LCB) mount which confirmed the presence of L. corymbifera. The patient responded well to suction clearance and debridement followed by drug therapy with amphotericin B.
Facial nerve paralysis is a common problem encountered in the ear nose throat out-patient department (ENT OPD). Impacted wax and its adverse effects in the external ear canal are also quite routinely seen. Rarely do the two come together in the same patient. We report a case of unilateral facial nerve palsy that presented an interesting diagnostic dilemma.